The American Idol Experience opened last week at Disney's Hollywood Studios. Oh how I would have loved to have been there for the grand opening - it was the first time that all the previous Idols had been together and I understand the show was outstanding! The American Idol experience lets you become a part of the phenomenon that is American Idol. Guests 14 and older can audition for the show... and... guests ages 16-28 who are voted the best singer of the day will receive a Dream Ticket! A Dream Ticket will give your an opportunity to make a reservation to sing in front of an American Idol representative at an actual regional audition of the American Idol TV show! Here are some fantastic pictures of the grand opening as provided to us by our friends at Pictela. 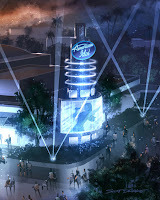 I can hardly wait for our next vacation to Orlando so we can check out the American Idol Experience for ourselves!